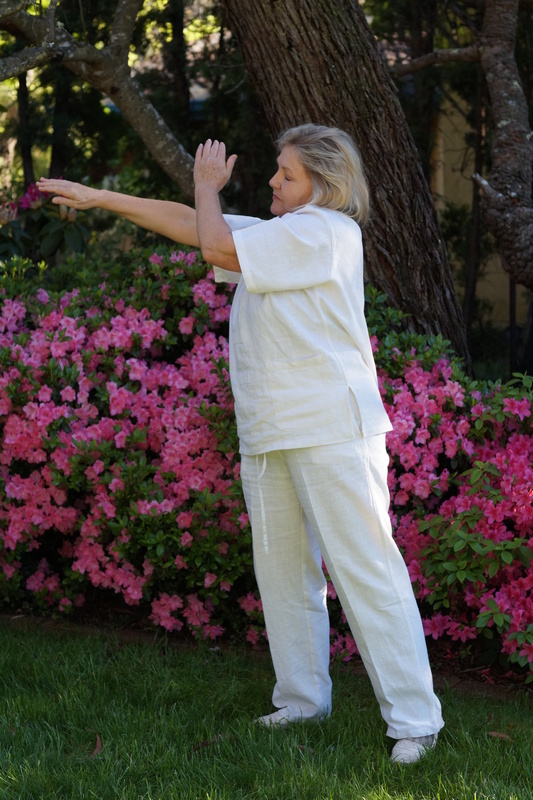 This easy practice is integral to Qigong and has been passed on from one generation to the next for hundreds of years. resting the hand on the skin to warm over various vital centres, acupoints or sore muscles. Let your body tell you where the massage is necessary. As you work with these suggestions below, add methods of your own. The most important thing is to do it. Reading how to do it or watching a video will not give you the benefits listed below. Just do it every day for a few minutes. Experience for yourself that it works. Self massage can be done sitting, standing or lying down. There are different routines. Repeat each one three, six or nine times as time permits. Face: Rub hands together and wash face, circulating your hands close enough to feel the warmth but not touching your skin as though looking in a mirror. Move hands clockwise and anti-clockwise. Visualise all your wrinkles being smoothed away and your skin feeling luxurious. Arms: Starting at the neck, tap three times to activate the gall bladder meridian, then all the way down the arms to the hands, turn arm over and all the way up and then three taps under the arms for the heart meridian. Chest : Work in three lines, three times from the middle to the outside. Start gently then get firmer as you feel comfortable. Activates heart and lungs. 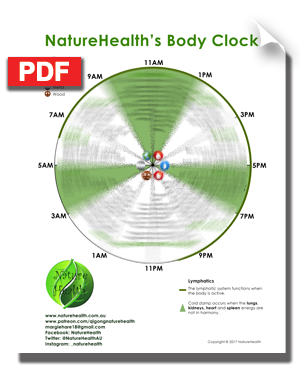 Abdomen : Bounce hands off the entire abdomen in large clockwise circles nine times. Repeat anti-clockwise nine times. Activates all internal organs. Legs: Starting at the buttocks and hips, bounce hands down the outside of the legs (activating the gall bladder meridian) then up the inside of the legs using cupped hands or fists. Kidneys: Rub hands together, cup the kidneys nine times bouncing hands off gently, then rub up and down nine times. Next rub three circles clockwise and anti-clockwise over the kidney. Now rub hands together again, they should be really warm. Then hold hands over the kidneys and draw in nine deep breaths into the kidneys to nourish them . As you begin to wake up start gentle deep breaths from the crown to Dan Tien bringing in the fresh morning energy to nourish the body. Rub your hands together and wash your face three times. Rub hand together and comb hair with finger tips three times. Pat from shoulder to finger tips, covering top and bottom of the arms, three times. Tap across the chest from the middle, three times. Bounce hands off the belly in clockwise and anti-clockwise circles, three timees. Tap down the legs outside, top and inside, three times. Rub hands together 18 times until your palms are warm. Then cover the eyes with your palms. Gently circle clockwise and anti-clockwise on both eyes together. Now get out of bed. You are ready to start your day. Lie still on your back and take a Qi shower. Three natural breathing breaths – soft, slow , long and deep. Feel more relaxed with each breath. Imagine your crown is a funnel to heaven. Draw in the heavenly gentle energy to lull you to sleep. Imagine it is washing you from head to toe, ridding your body of all the days negativity, thoughts, energy and happenings. After three breaths, stop the washing and imaging you are in a cocoon of heavenly energy. Gently rub your hands together, then wash your face with the warmth of your hand three times. Rub your hands together again and comb your hair with your finger tips. Rub your hands together again and knead the ears between thumb and forefinger up and down your ears, three times. Gently cup the ears with your palms and gently vacuum out three times. Now take a deep breath in, using your arms to scoop up the cool evening energy around you in the cocoon. Take this ball of energy, swallow it, and with your hands, stroke down your neck, over your thyroid, chest and abdomen. Then let hands come to rest, one hand over the other, on the energy centre Dan Tien, which is between your pubic bone and navel. Bask in the shower of heavenly energy that you are storing in Dan Tien as it continues to pour in through the funnel with the mind intention of peaceful , restful, regenerative, healing sleep. You will just drift off, allowing your body to rest whilst your spirit is at work. Relieves congestion in your body. Helps heal any strained and sore muscles you might have. Makes your Qi penetrate more deeply into your tissues. 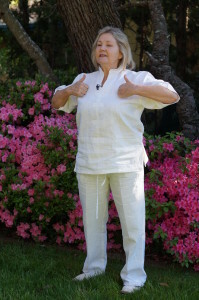 To learn more about Qigong and practice in the comfort of your home click here to purchase your Qigong DVD.